Mark Rogers/Lionsgate(NEW YORK) — Hellboy is in theaters today. It’s a reboot of Guillermo del Toro’s two-film series, which originally starred Ron Perlman as the red-skinned demon hero. 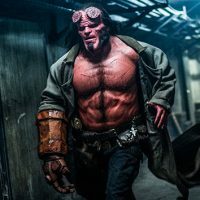 This new version stars Stranger Things’ David Harbour as Hellboy, and he tells ABC Radio he was quite familiar with the DC Comics source material even before the movies came out.